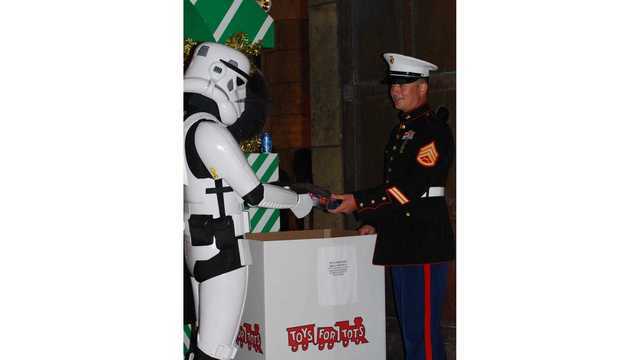 HONOLULU (KHON2) - Star Wars characters will collect toys for the U.S. Marine Corps Toys for Tots program at Honolulu Hale on Wednesday, December 5 from 6 p.m. to 8 p.m. The Star Wars characters are from a worldwide Star Wars organization called The 501st Legion. The cast includes Darth Vader, Stormtroopers, and Clone Troopers. Visitors may take photos with 501st Legion members. Since 1948, the U.S. Marine Corps has led the Toys for Tots program to make the holidays brighter for thousands of children. All toys collected at Honolulu Hale will be distributed to keiki in Hawaii. For more information on the Toys for Tots collection at Honolulu Hale, contact the Mayor's Office of Culture and the Arts at 768-MOCA (6622).